Mike Regenstreif:"I'm an editor, writer and broadcaster based in Ottawa and Montreal who has written I'm an editor, writer and broadcaster based in Ottawa and Montreal who has written about folk and roots music since the 1970s for Sing Out! Magazine and the Montreal Gazette and many other Canadian newspapers. My radio show, Folk Roots/Folk Branches was heard on CKUT in Montreal from 1994-2007 and I still occasionally guest-host shows there. Back in the 1970s and ‘80s I ran a folk club, the Golem, and produced most of Montreal’s folk-oriented concerts. 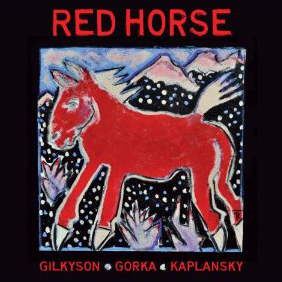 I also booked tours for such artists as Kate & Anna McGarrigle, Priscilla Herdman, Rosalie Sorrels, Bill Staines, Guy Van Duser & Billy Novick and Dakota Dave Hull & Sean Blackburn"
Red Horse is a project that brings together three of today’s finest singer-songwriters, Eliza Gilkyson, John Gorka and Lucy Kaplansky, as a kind of contemporary folk supergroup (something that Lucy did about a dozen years ago with Dar Williams and Richard Shindell as Cry Cry Cry). There are 12 songs with each taking the lead vocal on four with the others providing some gorgeous harmonies. Each sings one of their own songs, one written by each of the other two, and one cover tune. It’s a lovely, compelling CD filled with exquisite arrangements of superbly written songs. Given the three principals, how could it be anything but? Eliza opens the album with a lovely version of Neil Young’s “I Am a Child,” that perfectly captures the song’s naïveté. Later in the album Eliza offers lovely versions of Lucy’s “Promise Me,” a slow, luxurious love song; John’s “Forget to Breathe,” a dreamer’s imagining of a more perfect world; and her own “Walk Away from Love,” a song she first recorded on Hard Times In Babylon. John’s first song in the spotlight is Eliza’s “Wild Horse,” a new song to me (it’s not on any of the seven of Eliza’s albums on my shelves) that captures the essence of a free spirit in an arrangement that is seemingly perfect in its sparseness. John goes for a fuller production in his folk-rock version of Lucy’s love song, “Don’t Mind Me,” and then gets beautifully sparse again on the very folkish “Coshieville,” a song written by Stuart McGregor but which I associate with the great Scottish folksinger Archie Fisher, and his own “If These Walls Could Talk,” which I also don’t recognize and assume to be a new song. This is a CD I expect to listen to often in the months – indeed, years – to come. My one criticism is that the album was recorded in three different places with the files passed around so that the others could add their parts. While this approach resulted in a beautiful album, I miss the spontaneity that could have only come from Eliza, John and Lucy being in the studio and singing live from the floor together. The cover art, by the way, is a painting by Tom Russell, a great singer and songwriter who has also become increasingly recognized for his great visual art.